Erica created the ‘Art of Attention, chakra studies’ book which helped heal an addiction she had been battling for 25 years. Since then, she started helping others to realize their potential. For the pasts ten years, she has gathered over 200 women and men from more than 36 countries for week-long retreats to study one chakra at a time. 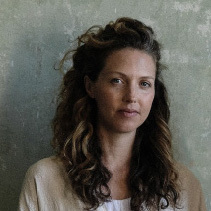 In these retreats, Erica uses her background as a Kundalini and Vinyasa trained teacher, as well as an experienced designer to introduce a new methodology — combining storytelling with emotionally connected yoga, visionary art, and framed nature—to inspire inner knowing, interconnectedness, and spiritual care. For her second book, Angelus, you can apply this signature process of inspiring daily practices from the comfort of your own home. In 2013 Erica was traveling around the globe teaching yoga. It was a rewarding but lonely existence. She was about to turn 38 and saw how she needed to refresh her conversation around family and career. This new revelation made her redesign her life and decide to set up her life in Amsterdam while finishing Angelus. Through the course of meeting new friends in Amsterdam, she met Asha. Their shared love for yoga and helping others transform their pain into helping the next generation fell into alignment. Motherheart for her is about teaching parents and children what we are not taught in school: how to resource the answers from within. Today she is 39 weeks pregnant, about to give birth to her first child at 41 years old. Erica’s dream for her daughter and parenting goes like this: The relationship with her daughter is true unconditional love. She feels energized fulfilling her needs with tenderness. She loves engaging with her and stimulating her awareness with opportunities to learn and grow. She is attentive, happy and easy tempered. As a mother, Erica is kind and compassionate with herself and how she treats herself. She accepts the learning curves it takes to be the best mom she can be, and her partner is there to support and encourage her through. Never she has felt more connected to her purpose. Being a mother is the one thing that solidifies my work and brings me huge successes in life. It makes her feel purposeful, worthy and eager to do the invaluable work of being a mom. In times of turmoil she takes a deep breath and goes deeper. Takes a deep breath and let go. Takes a deep breath and asks her highest love to arise. Talks to herself with the same tone she would use to talk to her daughter. Says: “I am doing the work. I am actively looking for moments where love can sweep in. I do not need someone else to take care of me. I do not have to reach out. I can reach in. I am giving the child in me everything it did not get from others. I will give it acknowledgment and validation. It is the greatest gift I have. A gift firstly to me, my heart, and eventually to others”. If she could tell her younger self something it would be: Be full of light by not finding fault in you or anyone else.